Contraptor, problem-solver, sculptor's assistant, mutant vehicle design and repair, startup genius's Man Friday. Specializing in accomplishing the impossible, with limited resources, in extreme environments. 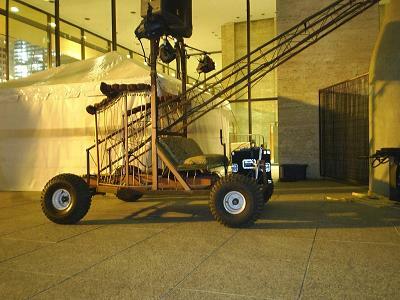 Mutant Vehicle Design & Repair - With years of experience working for Burning Man itself, I can design, source, fabricate, deliver, and chauffeur your mutant vehicle or art car at the Burning Man festival or any other. Your entire experience can be provided, with costumes, catering, and logistics. Also, I can repair that dusty art car that the auto shops won't touch. Professional Art Car Driver - With a Class A CDL, I'm prepared to drive a mutant vehicle of any size at the event of your choice, remaining sober while you can party with peace of mind. I can provide 10 years of accident-free DMV records and am well-versed in repair and maintenance for those unexpected breakdowns. 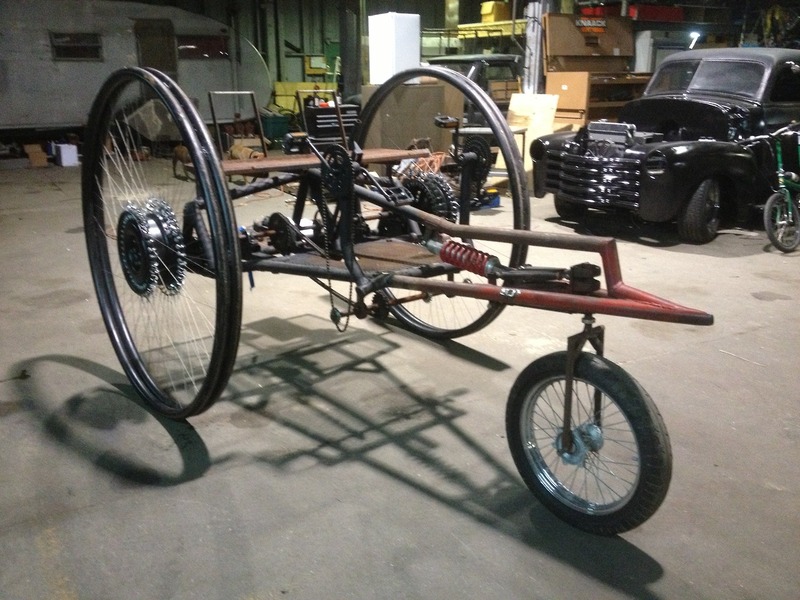 Custom Human-Powered Vehicles and Bicycles - I've devoted a lifetime to understanding what it takes to make a vehicle human-powered. 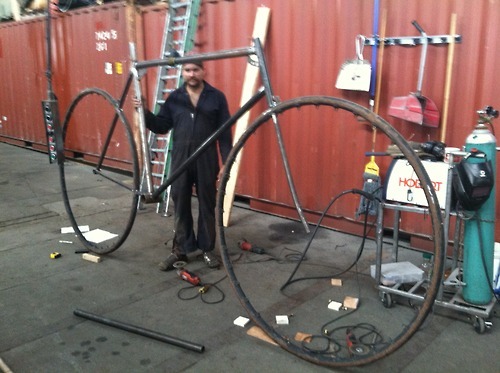 I can build a custom bike for you or something much larger, limited only by your imagination. 24 Hours of Lemons Teams - As a founding member of the Pinewood Dirtbags, I can help your new Lemons team build, make it to the event, and win in Class C. If you're interested in spending a lot of money on fancy equipment, that's not my specialty. My specialty is winning with the equipment on hand, with a limited budget, and in under extreme circumstances. THE PROBLEM: Professional catering for 80 off-the-grid. 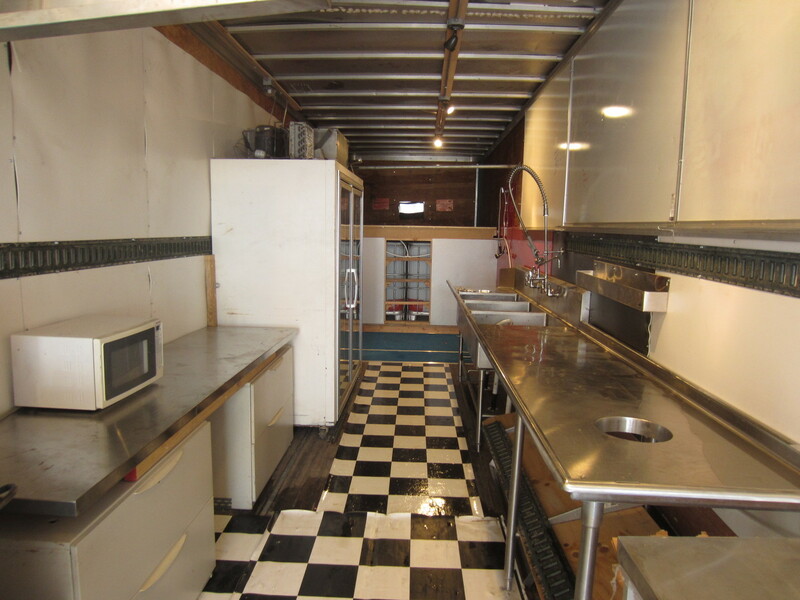 THE SOLUTION: The Big Kitchen is a 48' semi trailer that deploys to serve as the infrastructure for your entire camp. 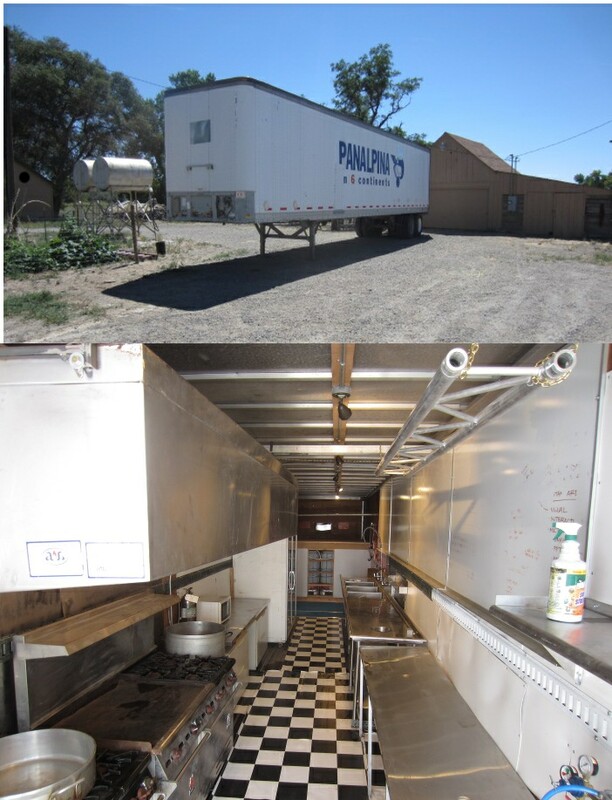 It has no living quarters, but rather a commercial kitchen to serve 50-100 campers, cold food storage, electrical distribution, showers, a cooled lounge area, greywater management, and 1200 gallons of drinking water storage. A deck slides in to double the cargo capacity for storage to the event, and the whole thing operates off-the-grid with generator power, propane fuel, and its own drinking water supply with greywater management. Roomy- as big as it gets. A larger kitchen than some urban eateries. Can haul your entire camp's stuff to the event. Anonymous- Doesn't look like anything valuable is inside to steal. Doesn't look like a freaky-deaky hippie bus just begging to be pulled over. Surprisingly cheap to store- Yard prices are low because most fleets are buying in bulk. Sometimes as low as $20/month compared to RV storage. Always Gets There- Unlike a cook trailer you tow, you don't have to rely on your own truck to get it there. The commercial carrier ensures the delivery- even if the guy breaks down, they just send another truck. No spending your festival week in Nixon on the phone trying to get a tow to Reno while your camp goes without a kitchen. THE RESULT: Available custom-made to your needs or for rent. 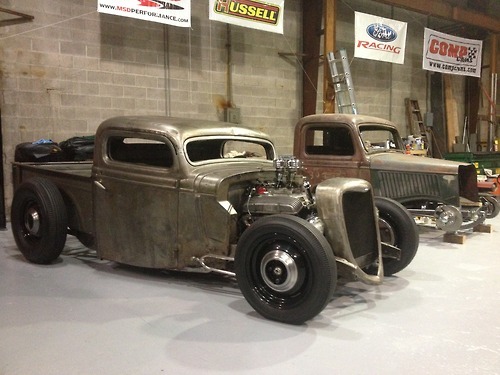 THE SOLUTION: Two-time successful entrepreneur Geoff Gates was starting his third company, a hot rod shop in West Oakland. During the first year of a company's existence, work can be a dynamic experience. I joined Alloy Motors as employee #1. This required me to be all things at once: Bookkeeper, process designer, hot rod mechanic, shop manager, and personal assistant. THE SOLUTION: I was contacted by this client because they had taken this vehicle to several fabrication shops and nobody wanted to touch it. People often come to me because they don't know who to whom to turn. The vehicle was elegantly made but lacked a certain ergonomic element that only my extensive human-power experience could provide. I fabricated a steering system, a shade structure, and added a differential to the axle while improving the driveline. The vehicle was also given a once-over for safety, eliminating places where fingers could get pinched or clothing snagged. The client also asked for a giant, 10-ft shadow sculpture of a bicycle which I provided. Johnny Amerika was in trouble. 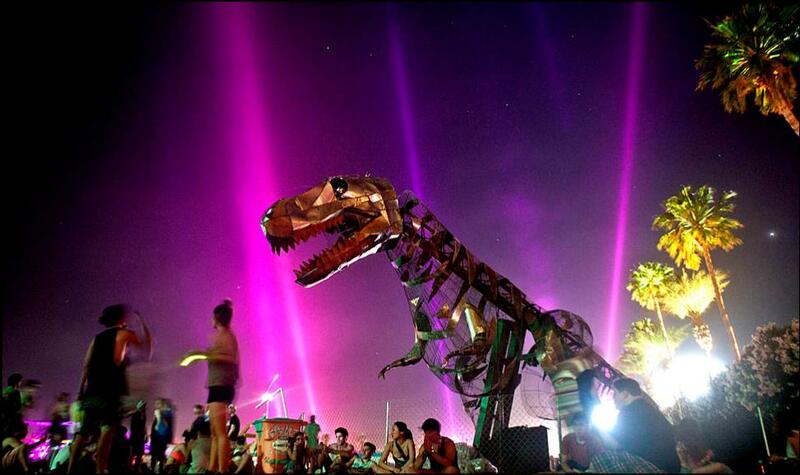 He was building a life-sized, hydraulic T-Rex to eat and crush the cans at the 2012 Coachella Festival. But he was behind schedule. THE SOLUTION: I grabbed my safety gear and drove to the southern California desert where we forwent sleep to finish the colossus before the weekend opening. 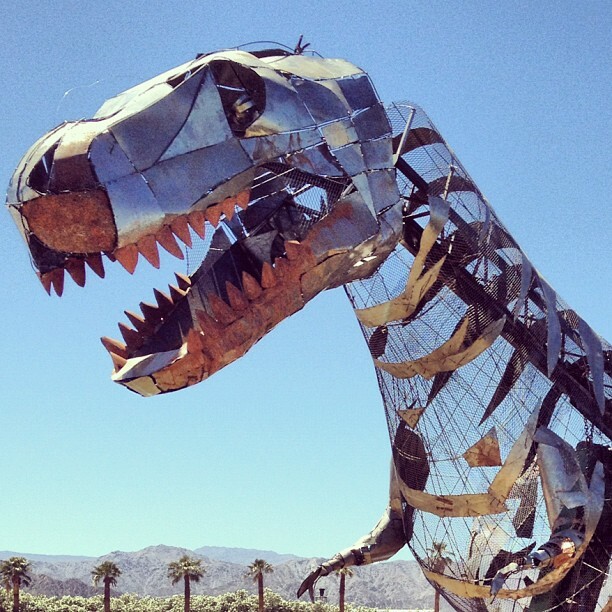 The T-Rex was a hit, encouraging participants to toss their recycling into its jagged metal maw. THE PROBLEM: LA's second-largest mansion had metalworking that needed to be perfect. THE SOLUTION: For an 86-million-dollar home, you don't just go to any metal shop. You go to the best. The work has to be immaculate. It has to be even better if your name is on a major architectural award. Working at Blank and Cables was a true honor. They produce only the highest-quality metal accents. The product is so well cared-for that none of the employees are allowed to actually physically touch it. THE RESULT: Metal finishing of accents in a mall-sized house with over 300 bannisters. THE SOLUTION: Enlisting my associate "Mudd", we sourced custom springs from a garage-door dealer, dug into my pile of gears and cogs, and built the world's first wind-up motorcycle and rode it 48 hours from the issue of the challenge. You can find details on the bike at Clockworkmotorcycle.org. THE RESULT: Successful creation of the sport of clockwork motorcycle racing. THE PROBLEM: Big art is big. 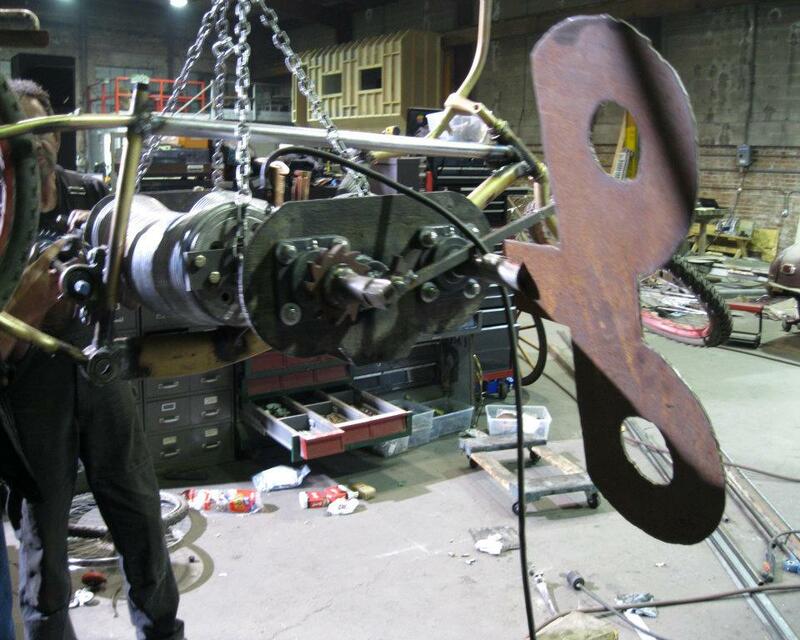 THE SOLUTION: Working with colossal or monumental sculpture is a paradox: Your pieces are so big they must be moved with heavy machinery, yet, the usual care must be observed. 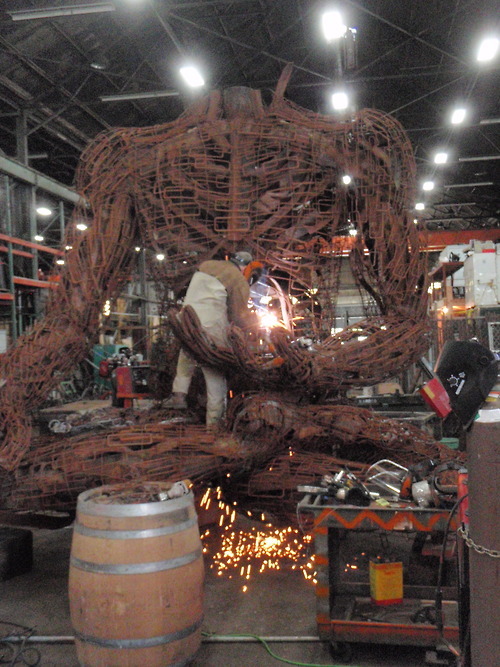 While working as a fabricator and wrangler on these sculptures, I also served as interim warehouse manager of a six-acre, 154-client artist's warehouse. This required me to do everything from streetsweeper repair to interacting with the City of Oakland. THE PROBLEM: Alternative-energy startup company has great idea, low sales. THE SOLUTION: This was a complicated, technical product with a $25k price. Therefore customers had questions. 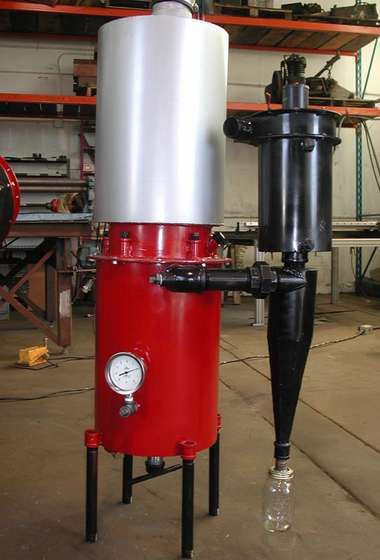 I streamlined fabrication and shipping processes, and opened up lines of communication both online and off. This required an intensive technical understanding of the product, and a voice for the company that was knowledgeable and trustworthy. In typical startup fashion I played the role of the production, shipping, tech support, sales, & marketing departments. THE RESULT: First-quarter 2011 sales equaled sales of entire 2009 fiscal year. For two years company was guided through the Valley of Death when many startups fail. Resounding success, startup saved. 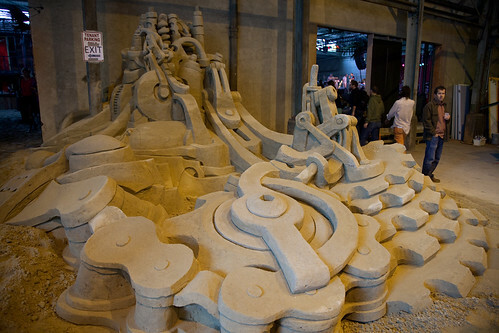 THE SOLUTION: Modified and operated heavy machinery to load sand (sometimes amid throngs of partygoers). Wrangled 50-ft woman. Installed indoor pools. Ensured compliance with fire code. Repaired forklifts. Swept. 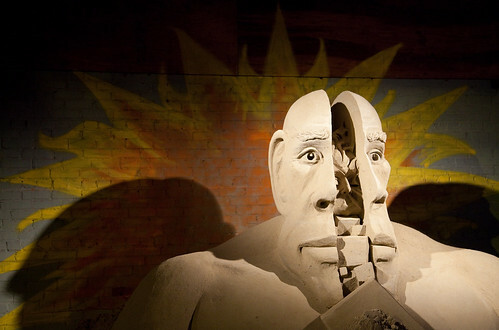 THE SCULPTURE: Fifty-thousand-pound life-sized copy of a popular board game. 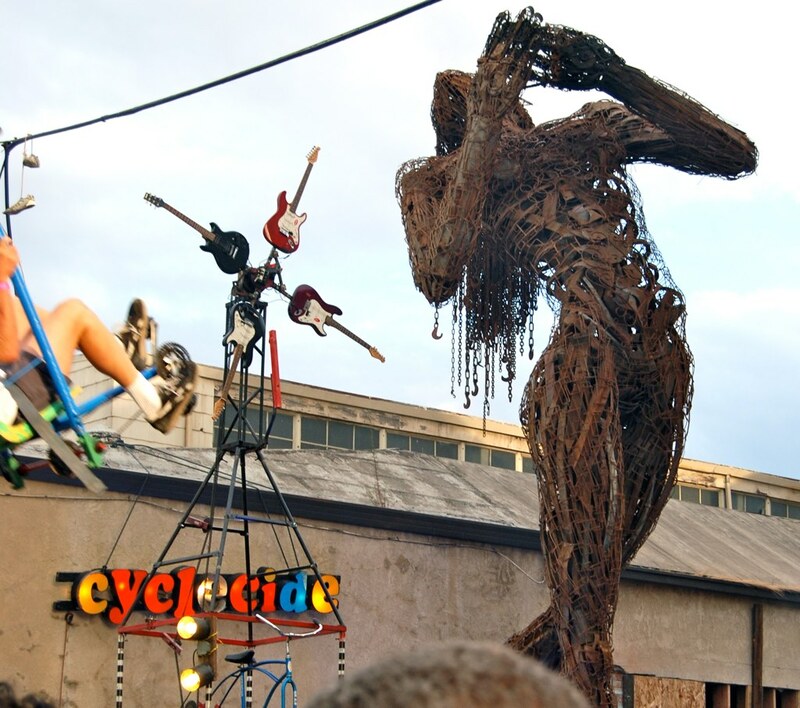 THE PROBLEM: Design a pedal-powered amusement and fire sculptures for a festival. 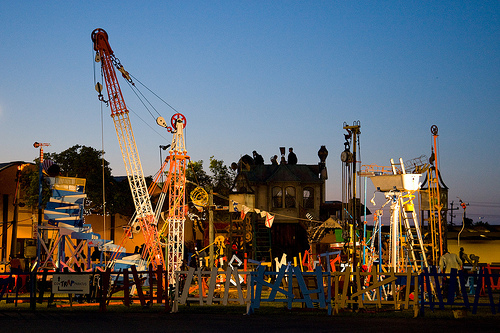 THE SOLUTION: For two summers, I acted as Artist in Resident at the Corinbank Festival. 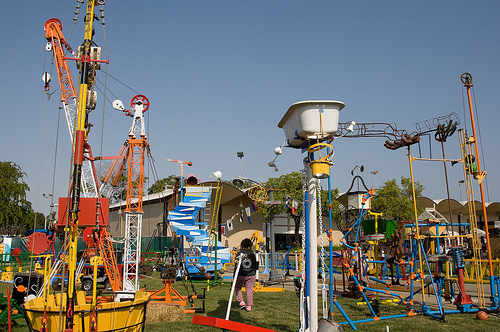 The first year I designed and operated the world's first pedal-powered bumper cars. For the second year, I wanted to express aspects of Australian culture in my work. 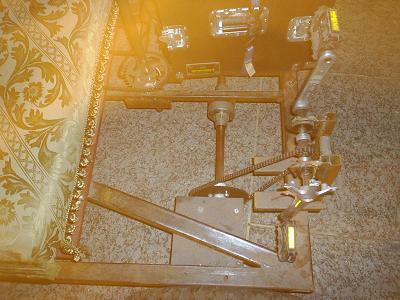 I acquired various pieces of metal that are important to Australians, such as a bowls mower, a lawnmower leaf catcher, a "barbie", a tea kettle, and various farm equipment. 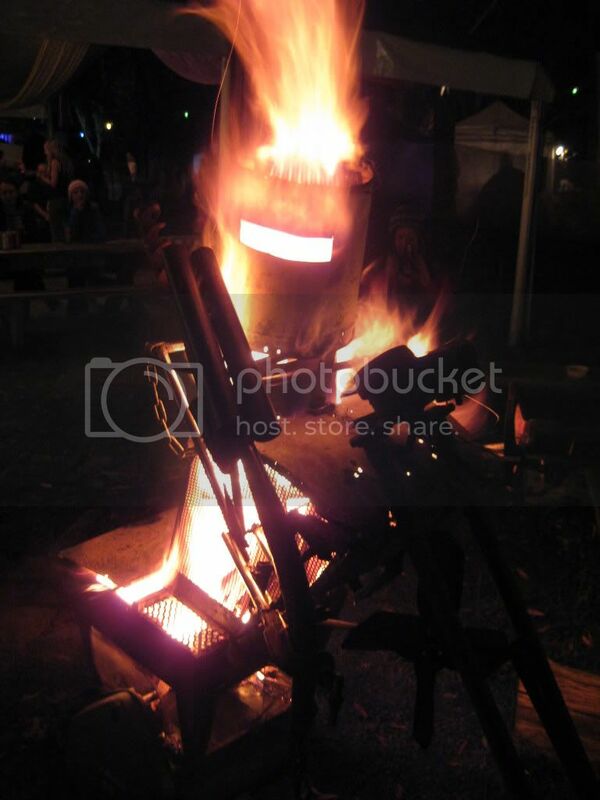 I added to this the legend of the infamous bushranger Ned Kelly and created NED 3000, a robot chopper outlaw burn barrel. THE SOLUTION: A simple rule for a crane is that the weight on the end times the ratio of the boom to the counterweight's length equals the weight of the counterweight. The original design called for an 800 lb. counterweight which would support 50 lbs at the end of a 16 foot boom. 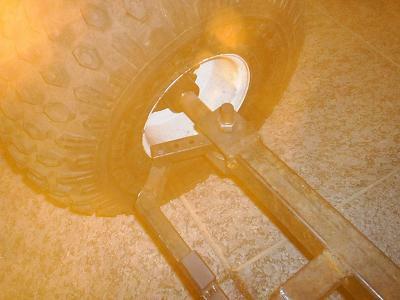 Consequently this vehicle was extremely overbuilt, with ATV wheels, a differential, and a gear ratio that would allow a single person to move that kind of weight. I had to fabricate my own axle stub brackets. This project represents a particular combination of form and function that I always strive for and am quite proud of in this creation.